Now will he be honest, put up some excuse for the money, or talk bad on me? Can't wait. I couldn't believe this would happen. He did what the logical person would have done. I couldn't believe that wicker10 just trashed his 5 years experience of the game. If he doesnt play, it has no value for him. Whats the point of 10 years experience of running if you lose both of your legs. What is wrong with koreans? They often host casinos. I have noticed them most of the times, people who play casinos are mostly Koreans. But still, some Koreans are okay, I had a few Korean players before and they were good. And also, Wicker10 got a new position in PW as a moderator and well now, he is enjoying his life. If Wicker10 is a sellout for selling his account that makes Seth and Hamumu sellouts for selling Growtopia and Ubisoft sellouts for selling subscriptions. 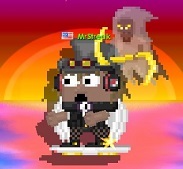 I quit Growtopia. I play Pixel Worlds instead now since I much prefer it. I'm called Fyn, if you see me say hi! Well, wicker is a moderator at PW now. tho i dont see a rule anywhere saying that ubisoft and seth/hamumu werent allowed to do it.